Patton’s kind, caring attitude – and positive approach to all he does – lifts the spirits of the individuals in our care and our employees every day. 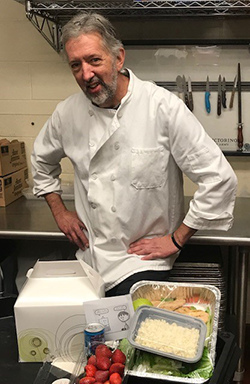 Several years ago – to lighten the mood in Devereux New York’s business office – Patton began adding jokes to food service bills he submitted to his team members. Patton also strives to bring smiles to the faces of the youth he serves at Devereux New York. One day, when a student – who was helping him mop the dining room floor – seemed down, Patton cracked a joke and encouraged him to come up with one of his own. Recently, Patton began adding jokes – printed on tiny strips of paper – to the boxed lunches he creates for various meetings held on campus. Diners eagerly eat up his unwavering wit, along with his team’s tasty eggplant, tomato and mozzarella sandwiches, guacamole and strawberry shortcake. During a recent visit, Devereux’s national Quality Improvement (QI) team praised Patton for his deliciously thoughtful meals. “We want to thank Doug and his staff for everything they do to help brighten the day of all who visit Devereux New York – and for truly exemplifying the values of Servant Leadership by putting people first,” the QI team said. “What better way to bring people together than through good food and good jokes? Visit http://www.devereux.org/site/PageServer?pagename=ny_index for more information. This entry was posted in Uncategorized and tagged change, children, Devereux Advanced Behavioral Health New York, Doug Patton, faith, families, Food Service Manager, hope, life changing, live dreams, love, new york, New York City, New York State, overcome obstacles, safety, Today's Honoree, youth. Bookmark the permalink.